Why yes, this IS a Friday comic! Find out Monday! FRIDAY COMIC! WHEE! Okay, that'll be much less of a sting after the next update when anyone reading this just has to push the "next comic" button, but I'm wallowing in sadistic writer's glee for as long as I can. You simply cannot waste an opportunity to wallow. I spent some time trying to think up a fitting "hero" name for Grace, and "Tri-Squirrel" really was one of the options, but then I remembered that Grace has had a second name pretty much since the time of her first appearance. Greg wouldn't know of "Shade Tail", however, so Tri-Squirrel got a chance to shine after all. Incidentally, Greg speaks the truth in regard to there being a "Squirrel Girl". 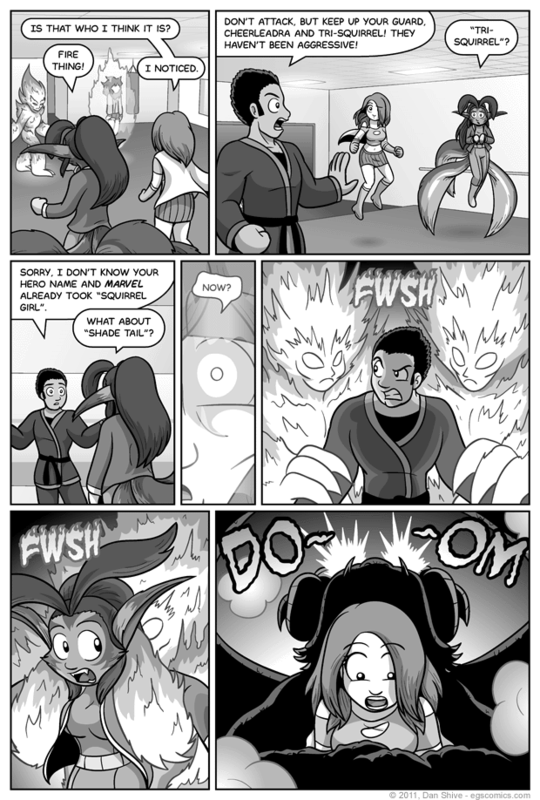 A reader recently expressed concern about EGS turning completely into a super hero comic, and while that's not my intent, I'm sure this particular comic page isn't going to convince anyone of that. Nonetheless, I don't think anyone should worry until spandex-clad super villains start holding up banks and shouting "curses" as they're foiled. Actually, that sounds pretty awesome. First villain? Captain Badgerpants. His debut and subsequent presence in the comic will be violently brief but memorable. The pose of the fire thing in panel one is based off of the old Big Foot footage. I was picturing what it would look like walking towards Dex and looking back at Grace, and what I imagined reminded me of that Big Foot footage, so I just went for it. FYI, for those who haven't heard, that footage of Big Foot has totally been debunked. It was actually of his lesser-known cousin, Medium Foot. I made an honest effort to keep it from looking like the monsters were grabbing or pressing anywhere they shouldn't be, and while I think I succeeded to some degree, I'm sure people will see what they want to see. Part of the issue is that when grabbing someone from behind and trying to get an actual hold of them, it's kind of hard to avoid the chest region. Not that I have experience with such behavior, mind you. I use nets fired from pressurized air cannons. So long as I'm mentioning the grabbing I should note that one should most definitely NOT imitate these holds. The hold Grace is in is known as a full nelson, which can be very dangerous. Grabbing people by the arms is less dangerous, but they could still flip out and elbow you or something. And don't get me started on the dangers of grabbing around a woman's chest region.